The good news is that by eating well and staying active you can avoid some of these problems. 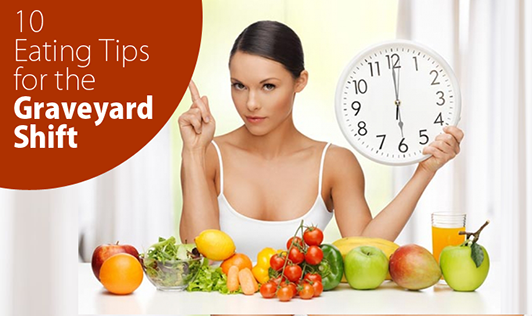 Follow these nutrition tips to stay healthy, alert, and feel your best at work and home. Eat your “main meal” before going to work. If you are on the afternoon shift, have your main meal at mid-day around noon. If you are on the evening shift, eat your main meal at about 6 pm before you go to work. Have a small meal and healthy snacks during your shift. Eating large meals during the night can cause heartburn, gas, or constipation. It can also make you feel sleepy and sluggish. Be careful not to overeat on the job. Pack your own healthy snacks. It can be difficult to find healthy snacks during the afternoon and night shifts. The cafeteria may be closed. Vending machines may only carry salty or high fat snacks, and high calorie sugary drinks. Examples of good snacks are an apple with a small piece of low fat cheese or a handful of nuts with low fat yogurt. Avoid fatty, fried, or spicy foods. Foods such as hamburgers, fried chicken, and spicy chili may lead to heartburn and indigestion. Eating too much fat can also increase your risk of heart disease and type 2 diabetes. Stay well hydrated. Drink plenty of water to prevent dehydration. It may help you to stay alert and not feel so tired during your shift. Keep a water bottle nearby and take sips even before you feel thirsty. Low fat milk, tea, unsweetened herbal tea, and low sodium 100% vegetable juices are other nutritious beverages that you can drink. Watch the amount of 100% fruit juice you drink because the calories can add up quickly. Watch the caffeine. Drinking coffee, tea, and other caffeinated beverages can help you stay alert but don’t consume more than 400 mg of caffeine a day. That is about the amount of caffeine found in 4 small cups of regular coffee. Caffeine can stay in your system for up to eight hours. This can affect your sleep. Switch to decaffeinated drinks, unsweetened herbal tea or water about four hours before bedtime. Avoid alcohol. Avoid drinking alcohol after work and when you get home. A drink may make you feel more relaxed, but alcohol can disturb your sleep. Stay at a healthy body weight. Healthy eating and active living play a big role in helping you reach and maintain a healthy weight. When you have a healthy body weight, you’ll lower your chances of getting heart disease, diabetes, and some types of cancer. Stick to your routine. On your days off try to eat and sleep around the same times that you would if you were working your shift. That way your “internal clock” stays on schedule. Talk to the company’s occupational health nurse about the best sleeping schedule for you. Eat together. Whenever possible, try to eat at least one meal a day with your family. Families who eat together actually eat healthier and more well-balanced meals. Mealtimes are a great time to connect with each other too! Take a stretch break. Walk up a few flights of stairs or go for a brisk walk. Stay in touch. Working shifts can be stressful on your social and family lives. Keep in touch with your spouse and kids every day. Plan your vacation days in advance to attend family activities and events.